Parts just chucked in a box - not the way to do it! You've found and bought your restoration project, it's in the garage and your are itching to get cracking. Enthusiasm abounds and you just want to get stuck in. A long weekend and you will have most of it apart. In three months you will be driving your dream on the open road. Unfortunately it doesn't always work out like that. Three months turns into three years and the remove parts and the chuck in a box approach to the strip down now has you confused about what goes where. Worse, there's a growing pile of parts you don't recognise. We've all done it, not necessarily with restoration projects, even repairs and modifications that take a long time can cause similar chaos. So let's back up to just before your brought your project vehicle home and do some planning and organising. A full restore requires a lot of space, up to three times the size of the assembled vehicle, depending on how much of the original vehicle will be restored or reused. For a car interior trim takes up a lot of space and needs to be stored in a dry location to prevent the trim rotting. Body panels that are to be reused need to be stored where they won't be damaged and new panels need to be dry to prevent rusting. 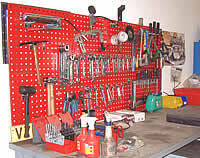 If possible invest in good quality racking for your garage or workshop. Monarch Shelving and Racking have a large range of new and reconditioned racking and will deliver to you. The amount of racking required depends on the vehicle and number of parts you will keep either for restoration or re-fitting. Next you need something to store the parts in. For small parts you can use plastic food bags or sick bags - they are plastic lined so don't leak oil and grease out, flat bottomed so stand up and can be written on. The parts bags then go in a larger container. 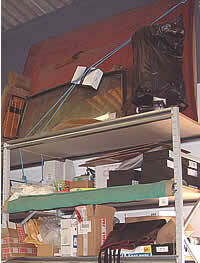 The size of the container depends on the storage space available, but could be stackable plastic containers, cardboard boxes or archive boxes, which have the advantage of a lid. 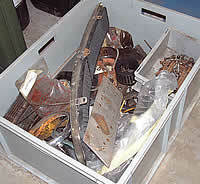 It's worth having a think at this point how you will group the parts in these containers or boxes - Restoration Manager can store the location of the removed part making it easier to locate in the future. The parts bags and boxes will need to be labeled, so if you aren't using a Dymo Labelwriter attached to Restoration Manager, you may need a stock of labels, depending on the parts bags you are using. The workshop manual should have a detailed diagram of the wiring loom, including the colour scheme. If you are in any doubt you can use tie on tags, available from office supply companies such as Viking Direct, to identify what should plug into the loom at what points. This is a useful technique if the wiring diagram isn't clear and you are planning to replace the loom as you can transfer the tags from the old loom to the new loom. If you are keeping the interior trim get hold of good quality plastic bags, large enough to seal the trim in, packing tape is ideal for this, or joining bags together for large items such as the seats. Create a new project in Restoration Manager. If it's your first time using the software take a look at the Quick Start Guide first - there is a PDF version installed with Restoration Manager. When creating the project in Restoration Manager you can either use the template to create groups (you can add, delete and change these to suit) or create groups to suit the way you work. With the garage organised and armed with a digital camera and Restoration Manager on a nearby computer you can start stripping your vehicle. Take pictures of the part in place, mounting points and any aspect of the removal that is tricky or could be forgotten - for example replacing a part upside down. Check the photographs are OK before taking the part off, remember Restoration Manager allows you to zoom into the photographs to see the detail, but if the photograph is blurred or out of focus you won't be able to take advantage of this. Download the photographs to the PC. Enter the part into Restoration Manager, adding the photographs and any notes that will be useful when restoring and assembling. You will also need to put in the location of the part in your storage system for easy location later in the project. There's a good chance that you won't remember the details when you come to assemble the part so put everything down that might be useful. If you have a Dymo Labelwriter attached you can print a label for the part when entering it into Restoration Manager. If not use a label or write the parts code Restoration Manager gives you. Organising your restoration project before and during the strip down phase takes time and commitment, but the time invested will benefit the project during the restoration and assembly phases, plus you will have a detailed record of the restoration of your dream vehicle.